You are here: Home i In Focus i In focus 2016 i Digitalisation – the Nordics showing the way i Bus drivers – a dying occupation as Finland goes for digitalised transport? Finnish commuters are facing a very different journey to work in the future. Many transport sector jobs can disappear, or at least change. New traffic legislation aims to make transport services more flexible, based on the sharing economy and call control. And the self-driving robot buses are just around the corner. The bus is filled with technology and enthusiasts. There is space for no more than ten people, and six seats. The electric bus EZ10 slowly starts moving to drive just under half a kilometre between three stops. It goes slowly, no more than 11 km/h, softly and quietly. 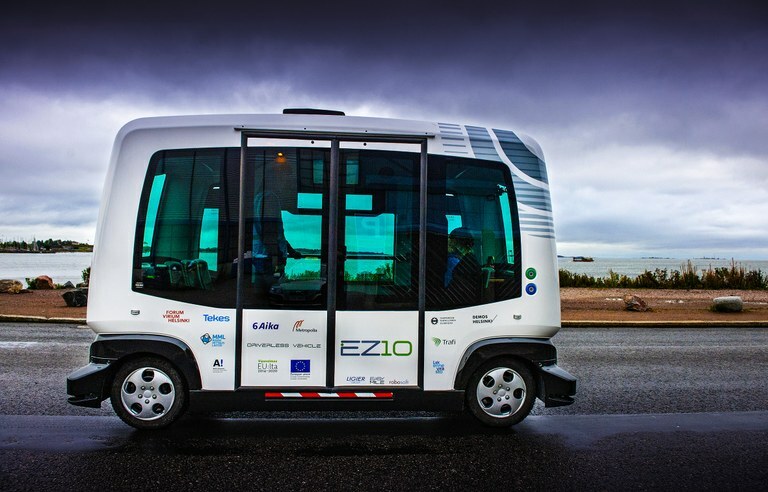 For the first time this autumn two self-driving busses are being tested among other vehicles in Finnish traffic. First at Helsinki's waterfront, later at the tech city of Otaniemi in Espoo and then in Tampere. This could become a part of the Finnish transport code, which aims to prepare the ground for traffic and mobility as a service. It moves very precisely down a prepared route. On a gravel road the track would deviate no more than 1.5 centimetres from the previous trip, explains Santamala. He is doing the talking during our test drive, but he has an operator on hand who will take over if a problem arises, for instance sounding an alarm bell to alert a taxi which has parked along the route. The robot bus is not yet intelligent enough to make a detour. Next to the route is a third helper. He controls the newly installed traffic lights along the special circuit, so that our bus always has a green light. All other traffic is stopped by a red light. He can also take over the manual steering of the bus with a remote control. When the AKT transport union’s member publication wrote a story about the bus it was called safe and hard working, but stupid. The bus drives well if everything goes according to plan, and very safely. But it is not particularly intelligent. It cannot predict how passers-by will react or act. Robot cars are news. There is great interest among students and teachers passing by. Many want to take a ride, but even more want to take pictures with their smartphones – also while they are driving a car or riding a bicycle. That is not good, says Harri Santamala. The last thing this experiment wants is an accident. So far the bus cannot deal with the Finnish winter or uneven surfaces. Probably not animals either, for instance elks which sometimes pop in to the Otanieme campus. The experiment is halted as it starts snowing. The bus cannot determine whether it is crawling children or a snow bank along the side of the road. There is no heating either. This prototype cannot learn, but that is sure to come, automation marches on. Harri Santamala nevertheless tells transport workers to take it easy. This solution also needs staff for controls, maintenance and more. Buses which are really self-driving will not enter traffic until 2030, according to Santamala. Drivers are worried nevertheless. Can the robot make passengers safe, can it change a tire if there is a puncture? Transport professionals remind people of the kind of service which bus drivers have been able to provide. The older generation might find it difficult to relate to the new technology too, since time tables, bookings and payments will happen on the mobile telephone in future. The new transport code is part of the government’s project to create an environment for digital growth. The aim is a ‘productivity leap’ in both public and private services. This happens by exploring the opportunities presented by digitalisation, and by getting rid of unnecessary red tape. There is a desire to prepare the ground for new technology, digitalisation and new business models within the transport sector. The environment will benefit as public transport improves and moves closer to customers, making private cars less relevant. It will become cheaper too, both for state funded transport and private travel. 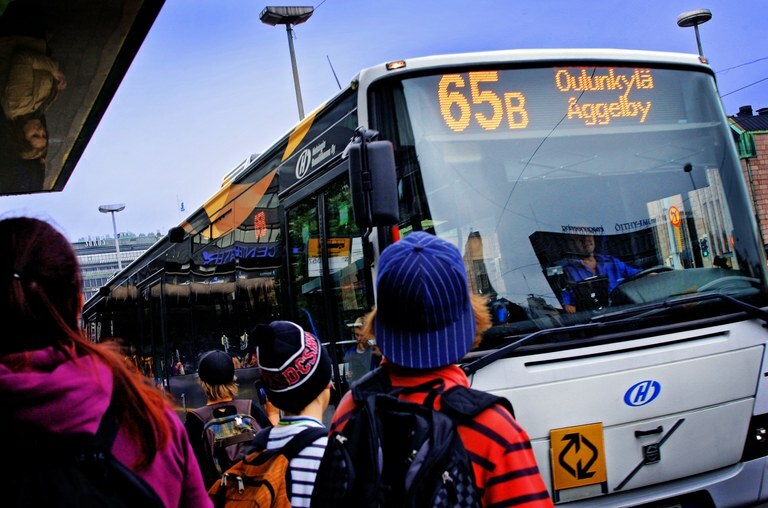 Finnish households spent 19 billion euro on transport in 2012, which amounts to 17 percent of their total consumption. The government talks about a considerable market and efficiency potential for the transport sector, when for instance the school bus can also transport goods and post, and when people can share transport. Everyone knows an efficiency drive could mean fewer jobs. But the Finnish government believes things could go in the opposite direction. When you get free competition, supply of and demand for services is likely to increase, which helps employment figures, according to the new transport code. Transport and supporting sectors employ around 10 percent of working Finns. The government proposal predicts an increase of nearly 15 000 new jobs in the transport sector by 2020. Finnish taxi drivers represent a powerful lobby and have been vocal in their opposition to plans of deregulating the taxi sector. They say jobs will disappear if anybody can start driving a taxi without a license or price regulation. It ended with a compromise from the government, where the Minister of Transport from the Center Party, Anne Berner, gave in on some minor points regarding the licensing of providing taxi services, in order to keep her own party, and not least the Finns Party, happy. The protests also centred on what can be demanded from taxi drivers. They should know the language, which makes it harder for immigrants who do not speak Finnish to find work as a taxi driver. The parliamentary debate also expressed worries about taxi services in rural areas. It is under threat if the obligation to have taxi ranks in all towns disappear, or becomes more expensive when regulations on prices are lifted. There will be no wild west like in Sweden when it comes to price structures and competition, the government coalition partners now promise. The transport code also makes Uber legal in Finland, as long as they open up their data to other operators and if their drivers report their income, pay taxes and get the same licenses as other drivers. The Minister of Transport Anne Berner considers the transport reform to be Finland’s chance to be a trailblazer in digitalisation and technology. There are even those who believe this could be the new Nokia. The present state of the transport sector could be compared to the telecoms market in the 1970s, when the sector was strictly regulated, monopolistic and inefficient. When the government allowed for competition in the telecoms market, Finland got high quality basic services for all, complete coverage across the country, new services for customers and new business opportunities for companies. Are we ready for the sharing economy? 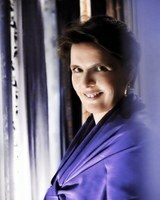 Anne Berner has had to defend her transport code. She says digitalisation and interoperability is needed to improve efficiency and user-friendliness within all of the transport sector. She also talks about the courage which is needed to open up the taxi trade to competition. But Finland might still not be ready for the sharing economy. “I actually believe our neighbours will be faster than us in certain areas,” says Anne Berner. Critics say Anne Berner has turned the transport code into a matter of ideological privatisation and deregulation. There is talk about private companies being established instead of allowing the transport network to stay in public hands, and the transfer of ownership and money into private pockets. There is more to come, including a new company structure for the transport network and how it is being financed. A state company should be responsible for the maintenance and development of the state owned transport network. The company reform would allow for the company to accept external investments, but not for a privatisation of the roads, the Ministry of Transport and Communications says. There are also changes afoot for trains. Right now Anne Berner can enjoy a growing sector and many new innovations from new start-ups in the transport sector. There are enormous expectations for coordinated transport with shared solutions. Strong regulation and little competition results in low productivity and puts Finland on the back foot in international competition. The entire transport reform can be sold on a promise of a functioning transport system which makes it easier to work and study and which generally improves people’s welfare, the national economy and spending.